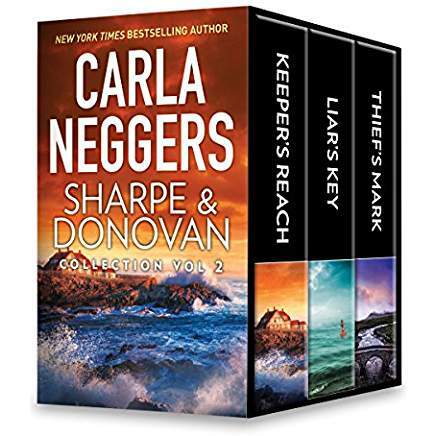 Continue the thrilling international intrigue and enduring romance of FBI special agents Emma Sharpe and Colin Donovan in the beloved series from New York Times bestselling author Carla Neggers, with three stories together in a collection for the first time. Emma Sharpe and Colin Donovan, two of the FBI’s most valuable agents, are preparing for their next big assignment—their wedding—when Colin’s brother alerts them that security contractors he knows from the military are snooping around their home turf on the Maine coast. What are they investigating—or do they have separate agendas? The case soon takes a drastic turn—Emma is targeted, and a connection surfaces to a recently solved international art theft case. As the tangled web of secrets unravels, Emma and Colin face their greatest danger yet. With everyone they know involved, they must decide who they can trust…or lose everything for good. Emma Sharpe is suspicious when retired Special Agent Gordon Wheelock, a legend in FBI art crimes, drops by her Boston office for a visit. Gordy says he’s heard rumors about stolen ancient mosaics. Especially since they involve Oliver York, an unrepentant English art thief. When a shocking death occurs, Emma is drawn into the investigation. The evidence points to a deadly conspiracy. From Boston to Maine to Ireland, Emma and Colin track a dangerous killer as the lives of their family and friends are at stake. With the help of their friend Irish priest Finian Bracken, the Sharpes and Donovans must band together to stop a killer. Emma Sharpe and Colin Donovan are enjoying the final day of their Irish honeymoon when a break-in at the home of Emma’s grandfather, private art detective Wendell Sharpe, points to international art thief Oliver York. When Emma and Colin arrive at York’s country home, a man is dead and Oliver has vanished. As the danger mounts, new questions arise about Oliver’s past. Do Emma and Colin dare trust him? With the trail leading to Ireland, Scotland and their own turf in the United States, the stakes are high, and Emma and Colin must unravel the decades-old tangle of secrets and lies before a killer strikes again.